9 years ago I felt like the Lord told me to get in shape because He wanted me for the long haul. I was overweight and had hypertension. The Doc said that I needed to do something about it. Choosing not to go with medication, I decided to look into another alternative. I began to find some incredible information that inspired me to start my journey to health. I have learned that we are all different and that we each need to find what works for us in our health journey. I am finding that there are many out there who want to get healthy and I believe that it is important that you come to the understanding that this is not going to be another diet, (I don’t believe in diets) but will be a lifestyle change. I think it is important that we take care of ourselves: our bodies, our souls, and our spirits. One of the things I’ve noticed in the church is that there are many who take care of their souls and spirits but don’t think it matters to take care of the temple of the Holy Ghost. I think its time to see a change and that we get our whole person well. I’m 58 years old and I feel great. I’ve found for me that lifting weights is something my body thrives on. When I come out of the gym I feel alive. I’ve released toxins out of my body and I know that the muscle that is coming will be burning fat. The thing is that we all need to find what works for us. Some like cardio better than lifting weights. The point is that we just need to move. Our bodies were not meant to be sedentary. Both my daughter and I have a personal trainer, which I highly advise, even if it’s just for a short time. They are trained to help you learn what is just right for you. Our trainer helps us with our diet and tells us how much protein, good carbs and good fat we need to eat to keep us going. Do you know that you are supposed to eat at least 70 grams of protein a day? If you are lifting weights it’s supposed to be much more than that. It’s not about eating less; it’s about what we call eating clean. I eat small portions every 2 hours. I try to have a protein, a good carb, and a good fat in that mix. I find myself having to eat so much food. Another thing that is important for your body is to drink lots of clean, filtered water. If you can’t get filtered, squeeze a lemon in your water every day. Water alkalizes your body, which is very important to good health. 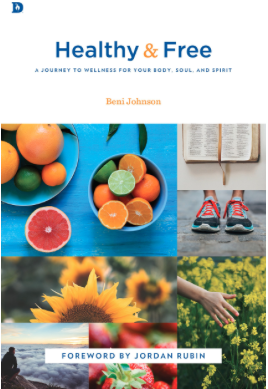 Beni, I am a Christian Nutritionist/Naturopath in Australia and your blog has revealed my heart. I have a passion to see the message of health get into the churches so that God’s people can find good health, in order to fulfil their purpose in life, instead of limping through life with no energy and feeling bad all the time. I love all your great information, I will ask that you please pray for me, pass on some of your anointing to me. ;o) I am 55 and I was going to the gym everyday. I could see the difference in my body however slow the progress was it felt great. I have a friend who was very heavy and decided on weight loss surgery. She was losing weight like crazy and here I was 6 – 8 pounds after six months of training. I let this get to me and just slowly but surely stopped going to the gym. I guess I got a little jealous, yes me a christian woman getting jealous and allowing this to defeat me. I want back the passion that I had for the gym and eating healthy. I am the heaviest I have ever been and as the woman from Australia said I am now with no energy and feeling pretty bad a lot. I am feeling very encouraged by you and your blog. I see when you do something you give it your all, I think I give bits and pieces and this is not enough. Thank you for taking the time to blog about your journey and you are an encouragement to me. I hope to one day soon be telling of my journey to successful health and a strong body!! Thank you, Thank you , Thank you. “Yes you will be telling your journey. Just figure out why you want this. That becomes your foundation. Remember it’s your journey not your friends journey or anybody else’s we all are different and we change differently. Thank you so much Beni for your commitment to living life to the fullest! I am a pastors wife with a full-time job outside of the church and a caregiver for my two parents. Life is so full and it is so great to know that God has positioned me for all of this! I am 53 and I try to make it to the gym 3 times a week. After reading your blog I am encourage again to get every aspect of my health right, especially the eating, I want to be in this for the long haul too! If more pastors took this stance, we’d have less people in need of healing. Yes you will be telling your journey. Just figure out why you want this. That becomes your foundation. Remember it’s your journey not your friends journey or anybody else’s we all are different and we change differently. Thanks you. With all my heart I want the kingdom manifested in me and to carry the kingdom to those around me. I need to be careful that the old tendency to compare myself to others and them to me, doesn’t crop up. This post is very entertaining but I see that you are not using the full earning potential of your page. Beni, I glad. I saw your blog. I like what you said. Find out why you want this, then make that your foundation. I know this concept. But didn’t connect it to eating healthy. How often will you write here in 2016. Just wanted let you know. You have a big viewing adience on earth and in heaven. I wonder if others look at you and think. Yeah its easy for her she’s small and fit.. But me I keep failing. I plan to kayak in the spring. I will take your wisdom here about why I want this into prayer. enjoyed listening on JONI”S TABLE TALK!!!! !